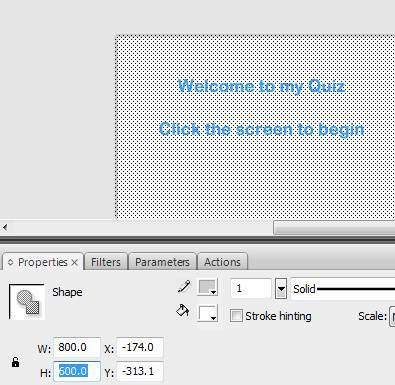 We want to make a simple fill-in-the-blanks quiz using Flash AS3. The first step is to prepare the documents that we will need. We need to create a Flash file named Quiz.fla and we need to create a document class called Main.as, where we will hold all of our code. 3 A CHECK button. This will be what the user clicks to check the answer. Name it chkbutton. You can use mine, from the source file. 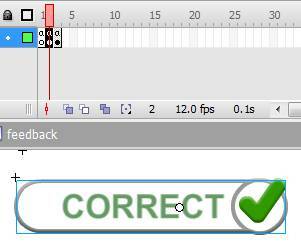 If you wish to design your own, draw the button, select it, right-click on it and select Convert to Symbol. You can use either a movieclip or a button for this. The dotted lines won’t appear in our final flash movie. I call it an empty class because it doesn’t do anything at the moment. We need to store our data somewhere, don’t we? Data in this case means the questions and the answers for our quiz. We could store it in the flash movie itself, we could store it in XML files or we could store it in our document class. You can add whatever questions you like, but they must be in quotations and they must be separated by commas. The answers must be in the same order. I’ve only put three questions here, but you can have as many as you like. We will add some code so that Flash automatically knows when the last question has been reached. … and then center the welcome message. Then select the box and the text (make sure both are selected), right click and select Convert to Symbol. Name the clip welcome and give it the Class Name Welcome (with a capital W). Make sure the registration point is top-left or you’ll need to mess with the alignment later on. Then delete it from the screen. Don’t worry, it will remain in the library; that’s where we want it. What we’ve done is to declare a class called Welcome and name a child (an instance) of the class welcome with a small w. Then we added it to the screen. Test the movie now (CTRL + ENTER). 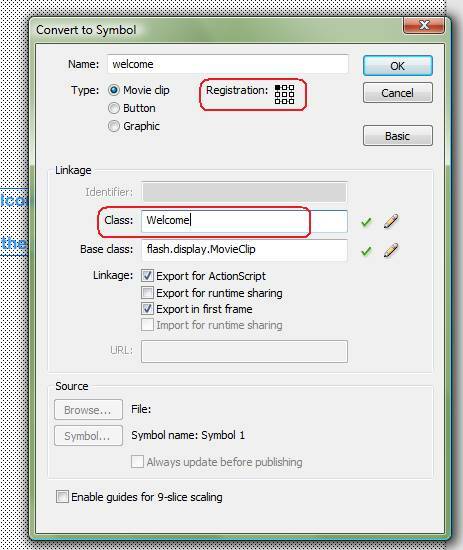 The first line adds an event listener, which listens for a mouse click on the welcome movie clip. When it detects this, it will run the function begin. Our function begin, in turn calls the function NewQuestion(), which we will write next. In addition, it removes the welcome message from the screen. As much as possible, everything should have its own function. That’s good programming technique. Let’s write a function to display a new question. But first, we need a variable to track the question number. It’ll need to be a variable. Our NewQuestion() function simply needs to increase the question number and then use the question number to get the correct data from our array. When we get the data from our array, we use QNum-1 because the array index begins from 0, but we are counting the question number from 1. Now let’s flesh this out. 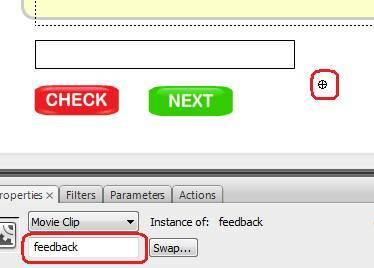 We want this function to check whether the text in the input box is correct, and then display feedback. 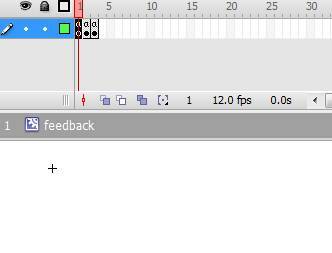 We’ll design an image of a tick and a cross for feedback in a moment. 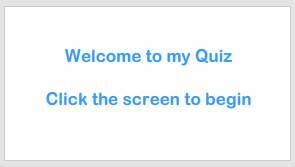 Finally, we wish to have a way for the user to move onto the next question. 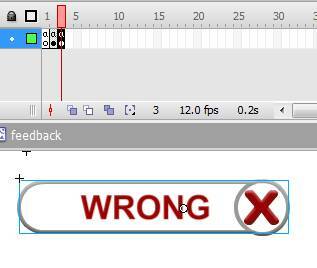 So we need to also design a NEXT button. We have used psuedocode for ‘display a tick’, ‘display a cross’ and ‘Display the next button’ because we haven’t designed these elements yet. But at least we have the structure in place. Now the CHECK button gives feedback properly. The NEXT button doesn’t work yet, but we’ll fix that in just a second. Also, why have we made the NEXT button visible when it was never invisible? We’ll look at all of that right now. 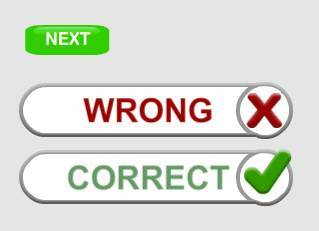 This function clears the input text box, clears the feedback and goes onto the next question. Test out what we have so far (CTRL + ENTER). You should see that everything is working until we get to the last question and click CHECK. Then we get an error message because we have run out of questions – our program is looking for data from our array that doesn’t exist. Let’s fix that now. …and I’m going to repeat what I did in Step 5, except I’ll name my Movie Clip ‘Goodbye’ (note the capital G). If you enjoyed this tute, there are plenty more at flashbynight.com/tutes , all with source code. Help yourself. There are plenty of finely crafted games (I hope) at flashbynight.com; please try them out and please give flashbynight some linkloving if you have a blog, or an account with Facebook, Twitter, Digg or Stumbleupon.